For fun or other reasons, sometimes we want or need to dine out. But restaurant meals are often among the least healthy foods we eat – frequently low in fiber and high in saturated fats, sugars, and salt – especially if we are health conscious in our at-home meals. Given this, it’s worth identifying at least one and ideally several restaurants and menu items in our area that allow us to eat the HumanaNatura way and follow HumanaNatura’s OurPlate healthy eating guidelines when we dine out. To underscore this idea, today’s example meal comes from a local bistro. As you will see, it scores high on the OurPlate rating scale, and is nutritious, delicious, and easy to prepare. This sample HumanaNatura Salad Meal is remarkably simple and has many potential variations. It begins with a grilled chicken breast, which is allowed to cool for a few minutes if freshly cooked or warmed if previously cooked and refrigerated. 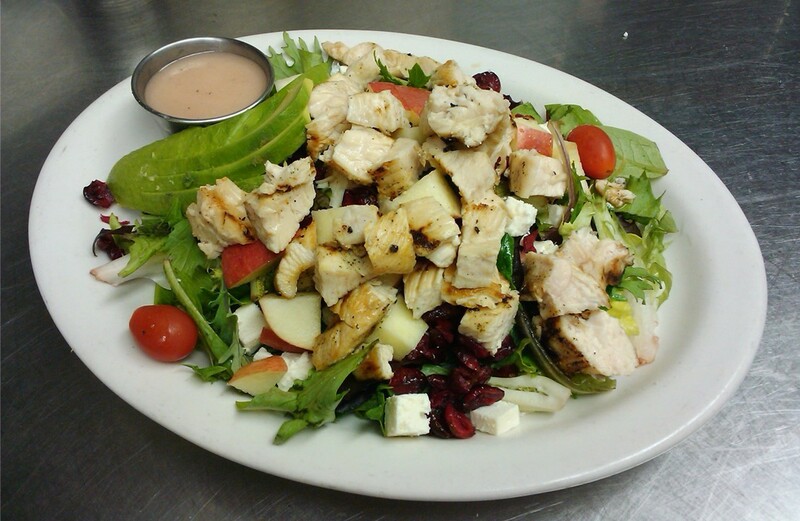 The chicken is cut into bite-sized pieces and placed atop a salad base of spring greens, along with a few small cubes of feta cheese, diced apple, dried cranberry, and sliced avocado. It’s then dressed with a champagne vinaigrette, or just olive oil and white balsamic vinegar, and garnished with parsley and black pepper. Easy variations include using salmon instead of chicken, pear or another fruit instead of apple, and chopped dates or figs in lieu of cranberries. Were we making this at home, we might also garnish the salad and any of these variations with a small nut – shelled pistachios or pine nuts would be an awesome addition. In any case, a delicious, healthy, and satisfying meal, whether at or away from home. Learn more about creating naturally delicious and optimally nutritious meals like this via OurPlate, HumanaNatura’s simple natural eating guide for designing optimally healthy modern meals. Experience how this science-based and 100% natural approach to our daily meals can change the way you eat, feel, and live. Sharpen your skills at making delicious and naturally healthy Salad Meals via our Salad Meal Overview. And explore the science and key principles of optimal Natural Eating through HumanaNatura’s comprehensive Personal Health Program. Once you have begun eating the HumanaNatura way, you can explore your many opportunities for new, more natural, and healthier life between meals – via HumanaNatura’s comprehensive four-part system for modern natural life and health. Check out the overview of our health techniques and programs at Welcome. This entry was posted on March 1, 2017, 01:00 and is filed under Natural Eating. You can follow any responses to this entry through RSS 2.0. You can leave a response, or trackback from your own site. It seems to be a favorite one, also easy and nice preparations.